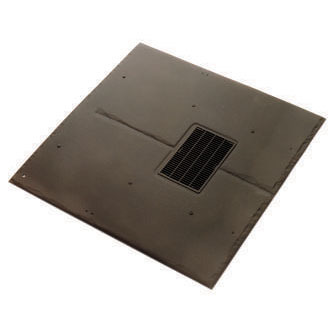 Corovent Slate Roofline Vents are an exceptionally discreet vent designed for use in slate roofs available riven to match natural slate or plain, matching man made tiles. Complete roofing to one course below the position for the slate vent. Hold vent in position as centrally as possible between the rafters and mark where the vent spigot touches the underlay. For 500mm x 250mm slates only - cut and remove section of batten. Cut underlay in a cross, fold up and back, nail over battens. Cut slates for next course below vent. Fit slate vent and nail to batten. Cut slates for next course (not for 600mm x 300mm roofline vents).